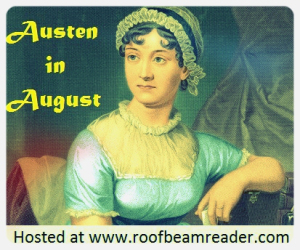 I am so excited to participate in "Austen in August". I have enjoyed Jane Austen's work in the past, but still have several of her books to read. Plus, this is social and you know that I am ever so social. The Goal: To read as many of Jane Austen’s works (finished or unfinished) as you want or are able to, during the month of August. Biographies, audiobooks, spin-offs, and re-reads also count. I will post throughout the month on different subjects, as well as with my own reviews of the Austen books I finish. We will be offering giveaways, guest posts, and other shenanigans, all of which are meant to inspire a great, interactive event. If you are going to participate, you can read any of Jane Austen’s novels, a biography about her, or any contemporary re-imaginings (such as Austenland or The Jane Austen Book Club, for example). All posts will help you qualify for prizes, which I’ll explain in a later post! A big thank you to Roof Beam Reader for hosting. For more details, visit the sign-up post.